I’d wanted to photograph the Carrick Hill gardens for quite some time, so when the director, Richard Heathcote, invited me to be their 2015 SALA artist, I jumped at the opportunity. 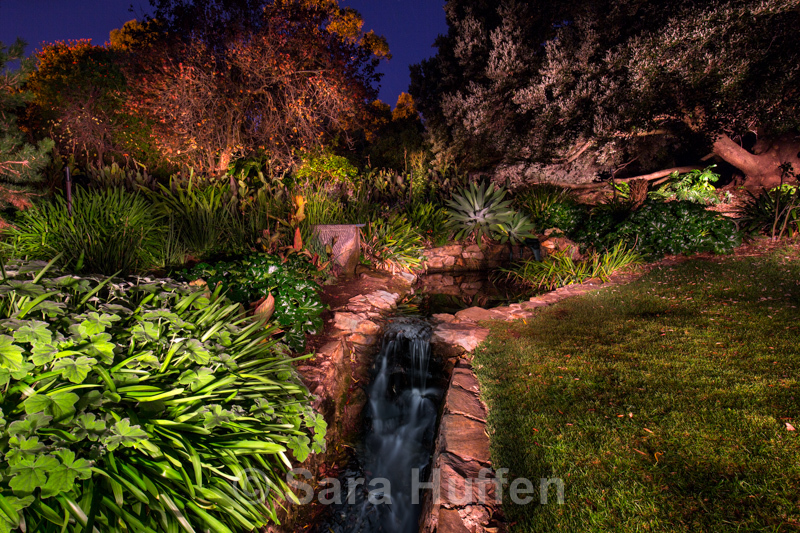 Not only did I get to photograph these beautiful gardens, but I also got to explore them at a time when not many people get to experience them — at night. I enjoy the work of Tokihiro Sato (night landscapes embellished by torchlight) and I have been finding my way with this style of shooting for a while now. I wanted to see how I could develop this approach to photographing landscapes into something that complemented the garden style of Carrick Hill. It was quite a feeling as the sun slipped over the horizon and the landscape around me fell into darkness. All the staff had left the grounds for the evening. It was just me, my best friend (Mum the torch wrangler extraordinaire), and a camera. As daylight saving ended and the nights grew darker, careful planning, coordination, location scouting and weather watching all merged into capturing one setup per night. Opening the camera shutter for prolonged periods allowed me to build the image by painting the landscape with torchlight. I create my images in almost total darkness. Painting the image at night enriches the intensity and colour of the landscape. It reveals colours you don’t normally see and allows me to emphasise and clarify different parts of the garden. The garden is lush and beautiful normally, and looking at it this way transforms it into something different and surreal, something that glows in the darkness. Thank you: Pam & Brian Huffen (Mum & Dad) for your unfailing love, support and encouragement, Mum for braving the cold dark nights to assist me in creating these images; Michael Lim for editing and photographic advice throughout the project; Richard Heathcote for entrusting me with this project and being so generous with allowing me to access the gardens; Sarah Carey for also helping with access and administration; the groundsmen for maintaining such immaculate gardens (and for not blowing away the pear leaves! ); John Wright for your help with the hanging; Cindy Halasz, staff and the Food Business for the venue and support for the opening event.